For the fourth year running CM Research is publishing the products that UK vets consider to be the Best New Veterinary Products of the last year. 290 practising UK vets spontaneously named the one product that had stood out for them amongst all other new veterinary products introduced in 2015. Osurnia by Elanco is a new treatment for otitis externa which was introduced in the UK in August 2015. According to the manufacturer its simple treatment schedule, which requires pet owners to apply only two doses of ear drops one week apart, means compliance with treatment has become more convenient and hopefully more likely. 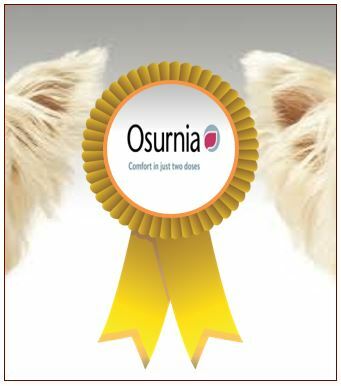 Osurnia is certainly popular among vets, receiving the highest number of mentions at 23%. Our survey was conducted online during March 2016 using Vetspanel, CM Research’s community of vets. The 290 participants were companion animal vets and in total these vets mentioned over 50 products. The objective of the survey is to provide vets with their peers’ unbiased judgement on which new veterinary products, services or devices have made the biggest impact on the industry. The questions were unprompted to ensure that the respondents were not influenced by pre-set survey options. As evidence of this freedom, many of the products that featured in the top rankings were launched before 2015. 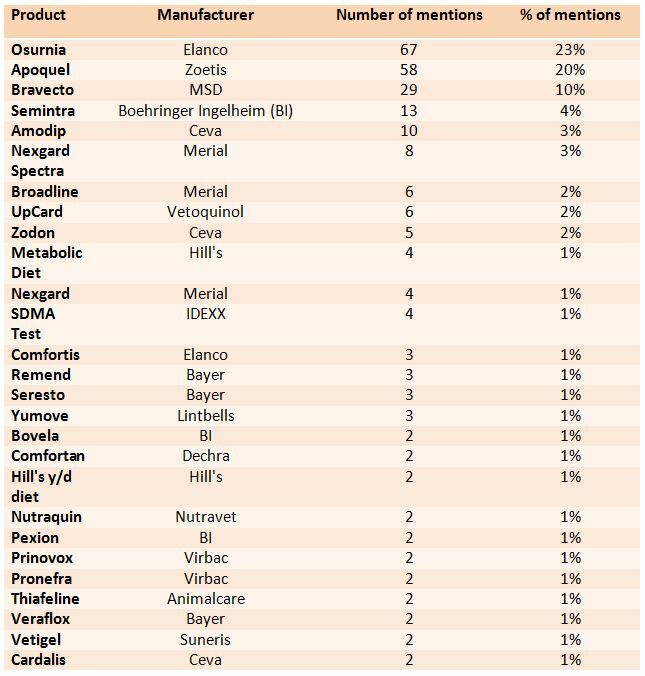 Last year’s winner Apoquel by Zoetis, a fast-acting treatment for the control of acute and chronic canine pruritus, came 2nd in this year’s survey with 20% of votes. Bravecto by MSD, an antiparasitic chewable treatment lasting up to 12 weeks, came 3rd with 10% of mentions. Other products that received a single mention: Douxo mousse by Sogeval, Adaptil by Ceva, SNAP Feline CardioPet Test by IDEXX, Cooldent by Virbac, Dermabond by Ethicon, Equisolon by BI, Flexadin Advanced by Vetoquinol, Fortiflora by Purina, Fungiconazole by Animalcare, Methimazole Transdermal Gel by Summit, Nobivac L4 by MSD, Nutramind by Nutravet, Onsior by Novartis, Otoprof by Vetruus, Pet Dent by Pharmavet, Prilactone by Ceva, Pro Kolin by Protexin, Therios by Ceva, TTA Rapid cage by Vet Instrumentation, Acticarp by Vetsonic, Antithyroid Gel, Clorexyderm by Vetruus, CLX wipes by Vetruus, Libeo by Ceva, Pet Life app by Bayer, Nelio by Alstoe, Orocam by Abbott, Sporimune by Dechra, Clindamycin tablet, Versican by Zoetis, VetConnect app by IDEXX, Zuprevo by Zoetis. CM Research is a market research agency specialising exclusively in the animal health sector. We have our own panels of veterinarians and veterinary nurses with over 16,000 members across 14 countries, including 11 European countries, USA, Brazil and Australia. Please feel free to use the results of our survey, referencing the source. We would be happy to provide you with any additional information or answer any queries you may have. Please get in touch with us at contact-us@cm-research.com.